“Amigos de Barry”and “Barry Sí, LBJ No” read the campaign buttons worn by supporters of 1964 Republican standard-bearer Barry Goldwater. The presidential contest pitted two Westerners against each other for the first time. Senator Goldwater represented Arizona in the U.S. Senate and President Lyndon Johnson was from Texas. 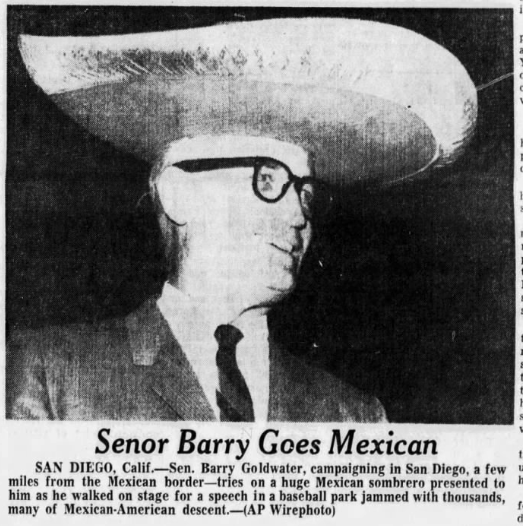 The candidate donned a sombrero in this wire service photo taken in San Diego. Two Latinos played roles in the Goldwater campaign. Fernando Penabaz , 44, was a Cuban-American. Born in Baltimore, he spoke for Cubans who fled the island after the triumph of Fidel Castro. He enjoyed national stature as a columnist for the Chicago Tribunesyndicate and lecturer against communism. The party named him as an assistant to William Miller, who organized the National Republican Convention. He was assigned to help draft the party platform. He was likewise appointed to the executive committee of the party’s nationality division. After the convention, the GOP created an additional position for him as the national chair for Cuban-American Affairs. Said Penabaz, “We will show that the Democratic administration is trying to sweep Cuba under the rug and that Goldwater would assert leadership against communism.” Most of the members of the exile community based in Miami were not yet eligible to vote. The other person to play a major role in the campaign was Manuel Ruiz Jr. The Los Angeles–born Mexican-American attorney served as the national chairman of the Hispanic division of Citizens of Goldwater. Ruiz was not a true believing conservative. He was active in the pursuit of civil rights in the forties and was then the legal advisor for the liberal Mexican-American Political Association (MAPA). MAPA endorsed Johnson, who had done more to champion Mexican Americans than all his predecessors. Goldwater opposed the 1964 Civil Right Act. Ruiz believed it was in the long-term interest of the community to be courted by both major parties. This required Mexican-Americans to be active not only in the Democratic but also in the Republican Party. He supported Nelson Rockefeller in the primary. The Spanish-speaking Rockefeller supported fair employment laws and had served as Roosevelt’s Assistant Secretary of State for American Affairs during World War II. When Goldwater won the nomination, Ruiz agreed to head the Hispanic division. The campaign organized a number of Mexican-themed events with the candidate in Southern California around the time of Mexican Independence Day. Fiestas were organized in Los Angeles, Imperial, and Orange counties. The Orange County Goldwater-Miller Mexican-American Committee sponsored a Mexican fiesta for Barry and Bill at Knott’s Berry Farm. The program featured two prominent Cuban speakers: Dr. Tirso del Junco, a classmate of Fidel Castro who took part in the Bay of Pigs invasion, and Jose Norman, former Havana columnist. Goldwater lost in a landslide because he suffered from a lack of support from his own party and from his deeply unpopular political positions; less than 10 percent of the Latinos voted for him. This entry was posted in California, Presidential Politics, South and tagged MAPA. Bookmark the permalink.